The night began with a beautiful Vespers service and we were blessed to have all four priests serve together. A delicious dinner and wine tasting followed the service. We are grateful to all the local farmer’s markets and wineries that donated to this event, specifically Stew Leonard’s from Yonkers, NY. A live jazz band helped set the tone for a lovely evening of fellowship and fun. It was inspiring to see so many college students and young professionals enjoying the evening. The 10th anniversary of this event saw great success with over 160 people in attendance. Louis Zagami, Development Officer at IOCC, delivered a presentation on the work IOCC has done worldwide and in the Balkans since 1992, including both short-term emergency relief and long-term development projects to help Serbs in the area. Fr. Djokan is looking forward to the opportunity to continue and strengthen his relationship with IOCC. 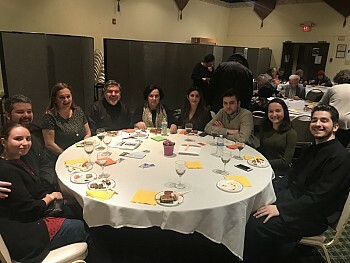 We, as Serbian Orthodox Christians, are thankful to IOCC for the work they have done and are still doing for our people in the Balkans, including Kosovo and Metohija. We look forward to our next event!